For over 30 years Pelican has built a reputation for manufacturing the toughest Protector™ Cases in the world. Pelican Protector™ cases have been thrown out of helicopters in Iraq, towed along frigid fjords in Norway and rolled over by SUVs in Tanzania. With only a few scratches to show on the outside, while contents are left unscathed. Getting your gear from point A to point B in the condition it's meant to be in, intact and functional is what it is all about. Because it could be that large format camera that will shoot next month's magazine cover or a heart defibrillator that could produce results you can't put a price on. Pelican cases are engineered to perform and be dependable in the most extreme enviroments like the 1610 Case with Padded Divider Set 1615 pictured. You break it, we replace it...forever™. Continual refinements are made through engineering and punishing tests are conducted for submersion and temperature extremes. The result is the toughest Protector™ Cases on the planet. Pelican Protector™ Cases offer an Automatic Pressure Equalization Valve and a Polymer o-ring with a tongue and groove fit resulting in a weather proof seal. 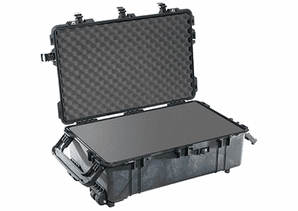 You will find the highest quality materials and construction possible in our Pelican cases. 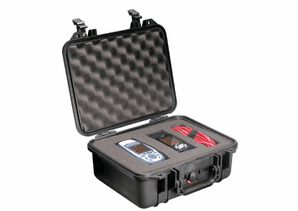 Pelican's Protector™ cases are put through rigorous independent laboratory testing procedures, including drop tests, vibration tests, and leak tests. Graduated deflection ribs direct impact forces away from the case without shattering the ribs. Easy open double throw latches are easier to open with the classic "C" clamp design that act like a pry bar to start the release and offers plenty of leverage to open with a light pull. Pelican Cases are made with Copolymer Polypropylene, using an open cell core and solid wall construction, which is actually stronger and lighter than the solid core wall that our competitors produce. Travel light with heavy protection. Pelican Protector cases are ideal for Cameras and lenses, Video equipment, Monitors, Laptop computers, Desktop computers, Tripods, Studio lighting equipment, and Digital cameras.